Detangle your luscious locks with this personalised hairbrush, custom printed with your photos, designs or text. Your hair deserves to be treated with care, and the mixed natural and nylon bristles gently separate the strands producing smooth, glossy results. Give your hair routine a makeover and design your own hairbrush. Printed on the front and back with your own designs, these custom made hair brushes make a fabulous gift for anyone who loves to keep their hair nice and silky. The natural and nylon bristles help to gently comb out any tangles. The perfect size to keep in your handbag or toiletry bag, there's no excuse for any knots. We print your designs onto the plastic body of the brush using a specialist digital process. The ink is fused with the plastic creating a long-lasting print that won't crack, scratch off or peel away. Each hairbrush is made to order, attaching the orange bristle cushion to the plastic frame by hand. This is a truly bespoke gift that any girl would love to have in their beauty collection. I was delighted with this hair brush. It's great quality, and the design that has been printed on it has come out really well. It will make a great Mother'S Day gift! I purchased two hairbrushes for my girls. Portrait, Front only (white base), The service was very quick and the quality was good. Who Will Love Their Own Custom Hair Brushes? Because they're gentle on the hair, these are perfect for children and adults alike. As your little one starts to do their own hair and dress themselves, encourage this milestone with a personalised hair brush printed with their name. Mums, grandmas, aunties, or even boys with a thick head of hair will love their own custom brush. Like many of our products, the personalised hair brush comes with a quantity discount, so get one for all the girls today and save money. Your design is printed using deep infusion technology which will bond your photo to your hairbrush handle. Our technicians are highly skilled in this top of the range digital printing process which produces sharp details and rich colours. Once this has been done, you are left with a stunning print that will last a lifetime. Our craftsmen will then assemble the rest of the hairbrush, adding the bristles and pad. This is all quality checked at every stage, before having its final checks and being shipped out to you. If you're printing a photo, we suggest keeping the main features on the wide paddle, as the handle is quite narrow. You could use the handle area to print a name or special message, perfect for times at the gym where it could easily get lost. The bristle side of the brush is better suited to a solid colour or repeated pattern. Go old school Hollywood glam and print an iconic quote, such as "If You Can't Handle Me at My Worst, You Don't Deserve Me at My Best - Marilyn Monroe". This will give your brush a vintage look, and will no doubt make you feel sassy. Keep it close to home and print a photo of you and your son or daughter. 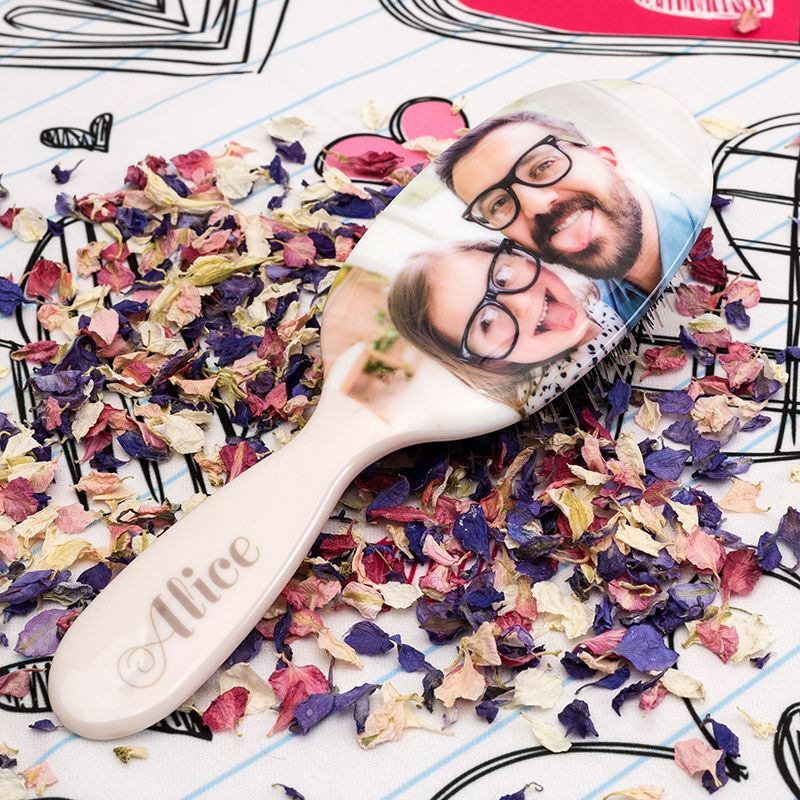 Rather than keeping a little photo in your purse that can easily get crumpled, you'll have this gorgeous personalised brush in your handbag featuring their sweet little faces.